Breath Of Life Daily: More perfect. A week ago, I had surgery to implant a permacath into my chest. A surgeon made a tiny incision and carefully inserted it into my jugular vein. 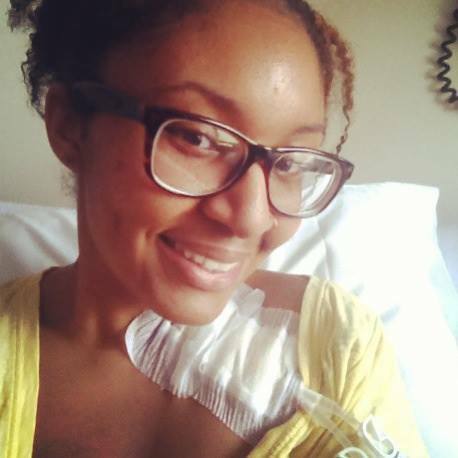 Afterwards, I went from Recovery to the Infusion Room in the same hospital for plasmapheresis. For two hours, I laid on a bed while my blood was pulled from my body, filtered through a machine, and then returned. I will repeat this therapy once a month for the rest of the year. I have Chronic Inflammatory Demyelinating Polyneuropathy (CIDP). It's an autoimmune disease that attacks my peripheral sensory nerves. In so many ways, it has upended my life. After the birth of my daughter in 2011, it came on so strong I wound up in the hospital for two weeks. I have weekly, at home treatment (IVIG) administered by a nurse. In my fridge, there is milk, grapes and glass bottles of immunoglobin. Many of my friends have moved out of state, and the ones who remain don't visit too often, if at all. I can't blame them. I don't go to poetry readings, jazz clubs or cafes the way I use to, and I don't visit them much, either. My mother was hospitalized twice in the past month, and I've only been able to visit her once. My brother and his wife are in overdrive, though, managing work, kids and frequent visits. My almost two year old daughter does not belong to any play groups. We aren't in Mommy & Me or take swim lessons at the Y. I feel exceedingly grateful just managing to take her to the park or Barnes & Noble. It's helped me get over myself. Sound harsh? Well, it's true. I've struggled with my physical appearance since childhood. I berated my body for it's short stature, small breasts and pear shape. I hated my hips, lips and thighs. I cried over my hair texture and my big nose. I remember a few times, actually allowing overplucked brows or crookedly filed nails to sour my mood. Now, I actually laugh at my former self and my vanity. I have scars a-plenty from IVs and a biopsy. I'll be rocking a patch of bright white bandages for the next six months with a couple of cords (actually called lumen) dangling at the bottom. I now joke that I wish I had one with USB capabilities. 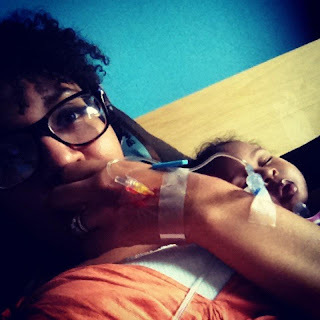 In short, illness ain't pretty, and sometimes life isn't, either. It's best to focus on the good. I stop to truly appreciate the little things. I love India Arie's "Little Things", extolling the beauty of those things often overlooked in life. When I was working full time, caught up in the grind, I took so much- too much- for granted. A bright sky, a pretty arrangement of flowers, even a great meal would often pass without note. Now? I take it all in. Not knowing when I'll be able to get out again, I take the time to savor a meal at a restaurant instead of scarfing it down. I take my time playing at the park with Zoe, pointing out the colors of flowers and even going on the slide with her. I strike up a conversation with the barista at Starbucks and compliment strangers with cute shoes or a nice hairstyle. "Consider it all joy, my brethren, when you encounter various trials, knowing that the testing of your faith produces endurance. And let endurance have its perfect result, so that you may be perfect and complete, lacking in nothing." I am being perfected because of my imperfections! My life forces me to confront my mortality. Yeah, you read that right. My life reminds me that I'm going to kick the bucket. Pretty morbid, I'll admit, but, yes, I'm thankful for this. Let me make this clear: as far as I know, this illness isn't putting me on the fast track to croaking. My organs are in great shape, so please hold off on the condolences. However, having a tube in my chest, popping handfuls of supplements, and the aches and pains are a very real reminder that this body will not last forever. It has an expiration date. My fried wiring has taught me to live with eternity in mind. This reorientation focuses me on God; the Everlasting, the Alpha and Omega, the Beginning and the End.